It’s the oldest carnival parade in the country and, without a doubt, one of the most popular. The creation of the so-called “Civilised Carnival” in Loulé occurred in 1906 and was the brainchild of José da Costa Guerreiro. Since then, every year around Carnival time, the streets of Loulé are filled with floats, cabeçudos (big heads) and samba groups to spread messages of political and social satire with fun and laughter. Meet The Moto Clube Faro is responsible for one of the most famous events in the Algarve – the Faro Bike Rally. The event, which saw its 35th edition in 2016, attracts millions of national and international bikers to the Algarvean capital. Besides the motorcycle and tattoo stands, there’s also a camping site and an appealing musical line-up. 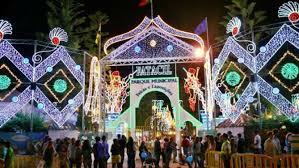 After 37 years of promoting the very best of crafts, tourism, agriculture, trade and industry, the biggest fair south of the Tejo is already part of the August routine for many families. The Fatacil, which takes place in Lagoa, also became known for its varied music line-up, with performances from some of the best-known names on the Portuguese music scene. One of the biggest medieval fairs in the country, the Silves Medieval Fair is now in its 13th edition. Usually organised during the first fortnight of August, the fair takes Silves back in time with a historical re-enactment of the Middle Ages in the former capital of the Al-Gharb Kingdom. Among food, music, poetry, jousting tournaments and a huge variety of exhibitors, there is much to do and see in this unique event. The first edition took place in 2004 and it hasn’t stopped growing since. Inspired by Mediterranean culture, the Med invades the historical centre of Loulé every year with artistic and cultural exhibitions. This is a festival that revolves around world music, as well as food, crafts, exhibits and street entertainment. The dates for 2017 have already been announced: June 29 and 30, and July 1. Make a note in your diary. A spot of incredible natural beauty, plenty of jazz and a diverse audience: the Lagoa Jazz Fest celebrated its 12th edition in 2016, at the Sítio das Fontes Municipal Park in Estombar. Organised since 2003 (with interruptions in 2012 and 2013), the festival has welcomed an impressive line-up of musicians, both solo acts and bands, among them Stanley Jordan, Maria João and Mário Laginha, and the New York Voices. In October 2007, Vilamoura hosted the first Portugal Masters. Nine editions later and the golf tournament has become one of the most prestigious events on the European Tour, placing the Algarve on the sport’s map and bringing some of the world’s best professional golfers to Portugal. To date, five English players have picked up the Masters title, but in 2016 it was the turn of Irishman Pádraig Harrington to pick up the prize money of €2 million. It is one of the most recent events (there have been six editions to date) but it has already won over our hearts and, mainly, our stomachs. Organised by the association Teia D’Impulsos, the Rota do Petisco began in Portimão but has since expanded to Lagos, Aljezur, Monchique, Silves and Lagoa, with its concept of a petisco (a Portuguese tapas) and drink for a symbolic cost of €3. The best bit? Part of the profits revert back to local charities. Vilamoura It is considered the biggest sporting event of the Algarve, drawing competitors of 30 different nationalities. Organised since 1998 (with a break from 2007 to 2012 in Comporta) by the Vilamoura Equestrian Centre, this show jumping competition is part of the Atlantic Tour and Champions Tour (two events that had an economic impact of €35 million on the region in 2015), and brings riders looking to gain points for the world ranking and win the attractive cash prizes.